We offer a learners training program in the comfort of your own home, and dummy test classes at our office. The student will receive the Best Training Material in the knowledge of the road signs, the road rules as well as the controls of the particular class of vehicle. It is guaranteed that the student will pass the learners the first time IF the student knows our material 100% of by heart. PLEASE do not try to go and write on general knowledge because we can guarantee that you will not pass!!! Study Material will be supplied to you in two different languages (Afr/Eng). Please note that the Material is not for the student’s own keeping and NO copies are allowed nor damage to our Material. A fine will be given to the mishandling of our manuals. Our Study material is designed by ourselves and is copyrighted!!! ID document will be required. Passport and traffic registration certificate (TRN) will be required if you are not a SA Citizen. The student will have to report to the testing station 30min prior to the test with the confirmation slip together with the student’s I.D. document. The student will only have one hour to write the test. This learner’s license is valid for 24 months. Receipts will be issued for all monies paid. Our prices include Testing Centre costs!! We take the student to the testing station to allocate and secure a test date. To prevent corruption the student must report to the testing station in person with the Driving School Instructor, to allocate/secure a test date. Supplying of Study Material (100% pass rate on OUR MATERIAL only). The Instructor will explain the study material to you. The student can come and do a pre-test just to evaluate him/her on how good he/she knows the material. Pre-tests are done on Weekdays from 9h00am till 12h00am AND Saturdays from 10h00am till 13h00pm. Feel free to phone us at the office for any misunderstanding of any of our questions in our study material (7h00am-20h00pm). Collection and drop off on the day of the test. Testing Centre fees are included. 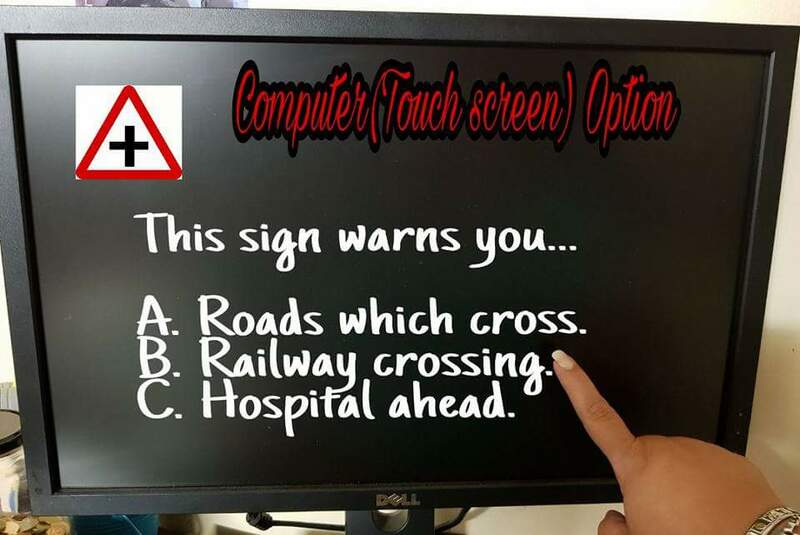 Option 2 – R1050 IN PRETORIA ON THE COMPUTER (TOUCH SCREEN-NEW PROGRAMME). This test consists of 1200 questions of which the system will randomly choose 64 questions for you to answer! We take the student to the testing station to allocate and secure a test date OR we can do it on the Student's behalf. We need only a copy of ID. You can e-mail the copy of id to us. Supplying of Study Material (GUIDELINES THAT WAS USED TO COMPILE THE ACTUAL TEST)The Instructor will explain the study material to you. PLEASE TAKE NOTE THAT ON THE TEST DATE THE EYETEST WILL BE DONE OR CERTIFICATE WILL BE USED! Feel free to phone us at the office for any misunderstanding of any of our questions in our study material (7h00am-20h00pm) The student can come and do a pre-test just to evaluate him/her on how good he/she knows the material. Pre-tests are done on Mondays from 9h00am till 12h00am and Saturdays from 10h00am till 13h00pm. We meet the student at the testing station to allocate and secure a test date OR we can do it on the Student's behalf. We need only a copy of ID. You can e-mail the copy of id to us. Student study with our study material.The student can come and do a pre-test just to evaluate him/her on how good he/she knows the material. Pre-tests are done on Mondays from 9h00am till 12h00am AND Saturdays from 10h00am till 13h00pm. 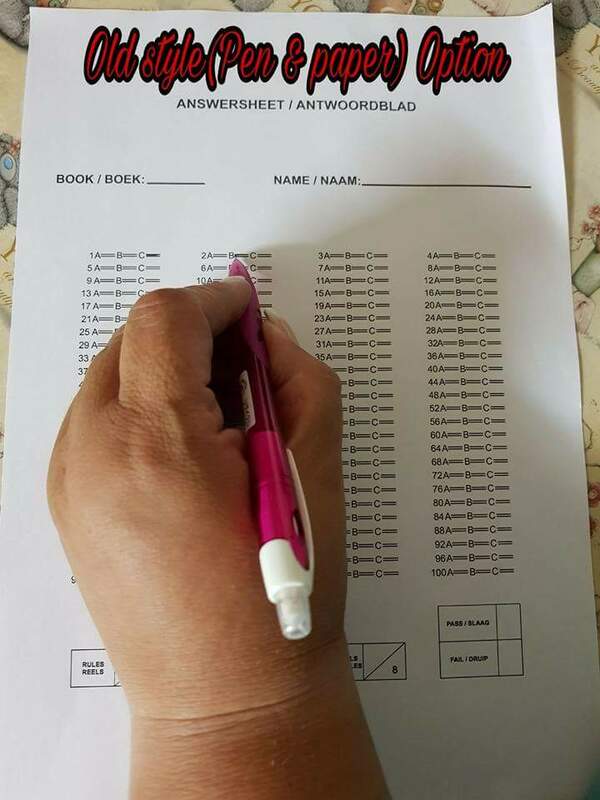 Student goes with own transport to the Testing Centre to go and write the Learners Test and meet us there to show where you need to report and to receive our study material back. Fees payable to the Testing station R108.00 Appointment money and R60.00 issuing money. Testing Centre fees are excluded in this package!! Only use of our study material. WRITING OR COMPUTER MATERIAL WILL BE E-MAILED AS SOON AS PROOF OF PAYMENT IS RECEIVED! The student can come and do a pre-test just to evaluate him/her on how good he/she knows the material. Pre-tests are done on Weekdays from 9h00am till 12h00am and on Saturdays from 10h00am till 13h00pm. No transport to and from testing centre. No allocation of test date!. Testing Centre fees are excluded.